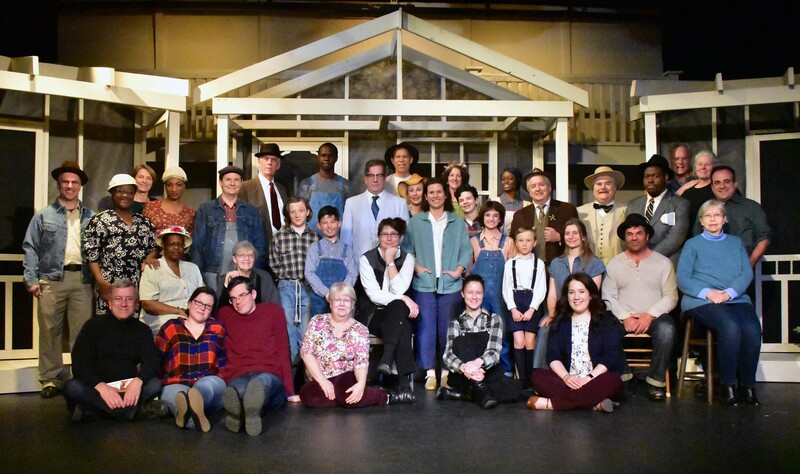 This weekend, the Providence Players of Fairfax will close the third production of its 19th season, To Kill a Mockingbird, written by Christopher Sergel, directed by Beth Gilles-Whitehead. DcMetroTheaterArts.com Reviewer William Powell wrote that the show “is easily one of the top five shows on D.C. area stages this year, worthy of every accolade and award it may receive.” Tickets for this American classic, based on Harper Lee’s Pulitzer prize-winning novel and one of the best loved stories of all time, have been selling out fast. Closing night (Saturday 4/8) is completely sold out and just a few tickers remain for tonight’s performance (Friday, 4/7). Throughout the run of To Kill a Mockingbird, Providence Players member Julie Janson has been chatting with members of the cast and crew. 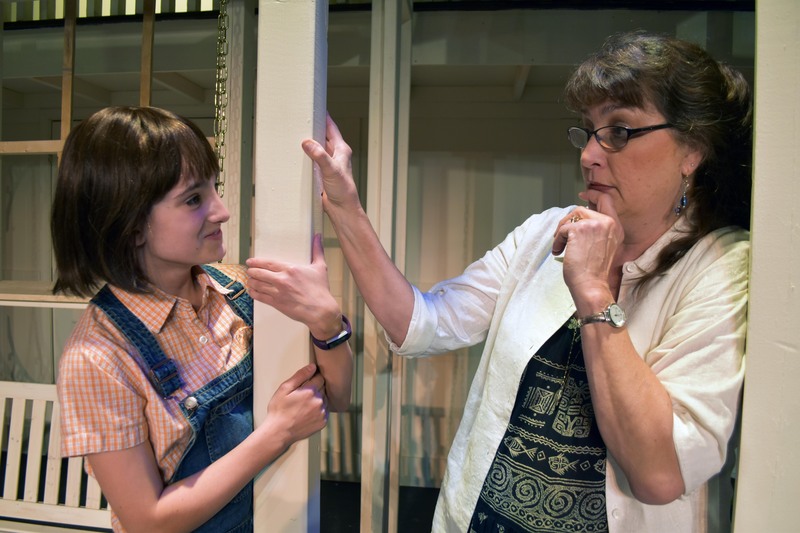 In this interview with Mockingbird director Beth Whitehead and her stage manager (for this production) husband, David Whitehead we not only discussed the show, but theatre/family balance and the differences between community and professional theatre. Julie: What is your theatre background? Beth: I began theatre in high school, continued on to get a B.A. in theatre arts at the University of Washington, Seattle, then went on to get my masters in theatre (acting) at Cornell University. After graduating from Cornell I moved back to Seattle to pursue professional theatre. David: I also started doing theater in 9th grade with my first production of You Can’t Take It With You. 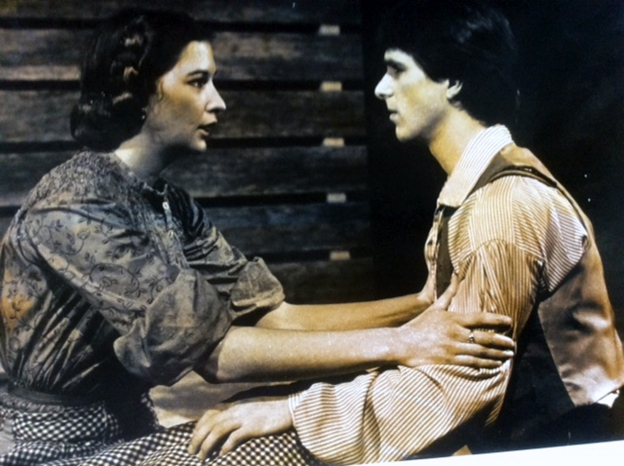 I did some 20 productions in high school then was accepted into Webster University’s Conservatory of Theater Arts from where I moved to Seattle to start my acting career. I worked as a professional actor and director until 1996, so for 12 years. 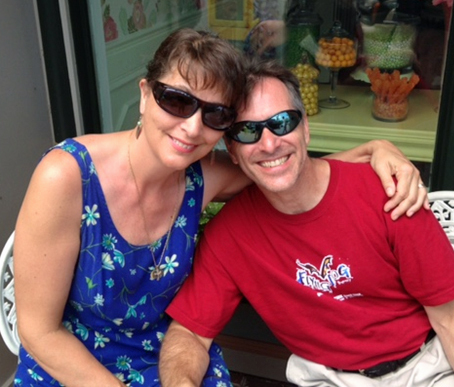 Beth: We met at the Seattle Children’s in 1984. We were cast as mother and son in an original musical called, “Tall tales from Mark Twain”. We went on to work at the theatre for a while and fell in love. We got married in 1985. Once you decided to start a family, how did you balance that with your love for theater? Beth: We traveled to Alaska, Montana and did theatre out of the area before starting a family. We decided that when we started having kids we would have one of us home with them. I was teaching acting, directing, doing commercials and industrial ad’s and working in the education area of the Seattle children’s theatre. David was acting and beginning to work in development at the children’s theatre. They were doing a capitol campaign to build a whole new facility on the grounds of the Seattle center. He was very good at fund raising. Between the different jobs we were juggling the kids and family life. And with some help we have always been home with our kids the majority of their growing up. I was able to volunteer a lot with their schools, I ran a drama program at the grade school for six years and also be home with the four kids. David: I remember I took a role in Orphans at San Jose Rep and I was gone from home for two full months. Fun show, but tough being on the road and apart. I decided after that show not to travel (unless very special) and take only roles in Seattle (though in 1989, I did accept a role in Bill Irwin’s Largely, New York which performed at the Kennedy Center and went to Broadway later that year). In 1992, I accepted roles in four major theater productions while holding down a full-time job as a Development Associate at Seattle Children’s Theater. That entire year, I never got a day off. After some reflection, I gave up acting and took a full-time Development Director position for another children’s organization. Though I still did some directing here and there, I left professional acting behind. What are the biggest differences between professional and community theatre? Beth: In professional theatre there are more defined roles. You have bigger teams to help in each area. The actor acts, the director directs, the designers design. They definitely collaborate. The equity rules define how many hours and breaks to keep actors from being abused. Community theatre allows many people to be involved, cross over, help each other and build a great community without worrying about making a living. David: As a professional, you take the jobs you can get, because it puts food on the table. In community theatre you get to choose what roles you want to play and get opportunities to do roles you would never get the chance to play professionally. It’s much more fun, challenging and exciting. Believe me, after you done the same roles in Christmas Carol four times in a row (I did that), you want to do interesting and different kinds of work. Community theater definitely offers that. And it’s a community – you build friendships and it’s almost a family: a volunteer community of artists who work together to produce some very exciting theater. In professional theater, you fight to get in. In community theatre, you are welcomed in. Many people in community theatre would like to try professional theatre. What advice do you have for them? Beth: You have to sacrifice a lot, you have to know that your chance of making a living in the theatre is slim, you have to have a lot of drive, a lot of discipline and a lot of passion. Besides working on your craft. You also have to be willing to get lots of different kinds of work to support yourself while pursuing your career. Once you are an equity actor you cannot do amateur work anymore unless you withdraw from the union. So making the decision or being offered your equity card is a big decision. You may never act again. Ask a lot of actors for advice and mentoring before making this decision. David: Ditto. Be prepared to work hard for little. You have to want it badly, and you need to recognize your own gaps in craft and talent, so you can work on them. There is a pretty big chance you won’t get where you want to be – and even if you do, it can take a long time of sacrificing. For this show, you are both filling significant roles. What do you like about working together on a show? Beth: We love working together. We always have. I’ve directed David, costumed him, acted with him, we’ve written shows together, I’ve done props for him, run lines at home with him. We collaborate very well. It has been great having our kids watch us continue doing theatre as we raised them and also getting them involved if they had interest. Our priorities have always been faith, family and doing theatre. David: I’ve never been a stage manager, but it’s fun! And it’s particularly fun with Beth. Planning is easier because you live in the same house, and it’s easier to reflect on what needs to happen next. I serve the director, and Beth LOVES that! She is quite straightforward about what she wants – because she is so good at seeing what she needs to see. Beth is a very talented director, and it is always more fun when you trust the artistic vision. It’s a lot of fun working with Beth. Beth, let’s talk a little more about this hit show you are closing this weekend. As the director, what was your creative process for bringing this show to life? The creative process for this show has really been first, getting to know the book over and over, inside and out. Getting inside the head and heart of Harper Lee and chewing on all the details of the world she created. The many interesting, complex people in her story have been a joy to live with. Second, setting up the auditions and having many talented folks come and want to be part of this story has been humbling. Having 85 people want to say and become the characters of this classic novel was eye opening. Third, casting the show early enough so the young actors, who really drive the story, could work on their lines and be really comfortable with them before starting rehearsals. Fourth, really guiding the actors to what I believe is so important in this story, the love of Atticus with his children and their love, respect and devotion to living in a world that he wants for them. A world with truth, integrity and compassion. Each person in this story is real and has to be grounded in truth or it doesn’t work. Why were you interested in directing this show? This is a book for all times, all generations and all who want to dig deeply into their true and authentic self. To be the one whom stands up for others, one who tries to walk in another’s shoes, one who wants to make each encounter a real moment of grace. Harper Lee’s words resonate and to hear them on stage is a gift. This story is a gift. I wanted to share it. To Kill a Mockingbird has been staged many times. Why do this show now? Doing a play of a great piece of literature is something all theatre should be doing, often. So many reasons to do this show now, ten years ago, ten years from now. The main reason; we can be better, we can do better, we must do better. This story is a loving way of showing us how. What do you hope people will have taken away from seeing To Kill a Mockingbird? I hope people will take away a sense of hope and purpose. That they will want to continue to integrate their words with their actions and make a difference. There is a part of us in each character in this story in each of us. But I believe we strive to live an Atticus kind of life. Which is why we read this book over and over. We love being Scout and imagining a dad like Atticus. This is a love story between Atticus and his children and the truth of how to live.